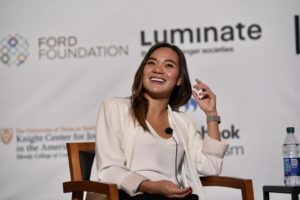 We’re spending more time on our phones now than ever, which makes understanding off-platform journalism important for newsrooms, said Millie Tran during her keynote speech April 12 at the International Symposium on Online Journalism (ISOJ). “The easiest way to tell you what off-platform is to tell you what it’s not,” said Tran, the Times’ deputy off-platform editor. On-platforms include The New York Times’ app, newsletters and push alerts while off-platforms refer to a larger umbrella of social media channels such as Facebook, Twitter, Apple News, Instagram and Google Search, she said. Nowadays, there is so much happening online that paying attention to digital stories that thrive on social channels is crucial, Tran said. She talked about how the story about the shooting death of rapper Nipsey Hussle got more coverage at the Times because of the attention it received on the internet. After the State of the Union Address, the photo of Nancy Pelosi clapping to President Donald Trump exploded in meme coverage, Tran said. Times photographer Doug Mills captured the moment and the Times added a back story of how he took the photo, his thoughts during the moment and how the Times executed that work, which made its coverage different from other news organizations, Tran said. Tran said it’s important for off-platform editors to be educated and to understand how to reach and communicate with different communities. “The value I hope to bring in this role is to first deeply understand the news value at The New York Times and to also deeply understand all of these communities off-platform and the opportunities we have to reach those communities. One way is to try to understand what the signals are and to combine news judgment with platform-specific knowledge, Tran added. Kathleen McElroy, director of the School of Journalism at the University of Texas at Austin, chaired the discussion with Tran and asked if there are any challenges working at The New York Times. One of the audience members asked Tran how smaller newsrooms could improve their practices and Tran said a lot of it is understanding how things work, then applying it to the specific newsroom, community and or audience. Understanding signals from search engines, social channels and applying that information to the organization, plus trying to reach out to communities and new audiences through various platforms, are ways to increase engagement in the newsroom, Tran said.